There are plenty of things to think about in any building project, and building along a shoreline can be especially complex. 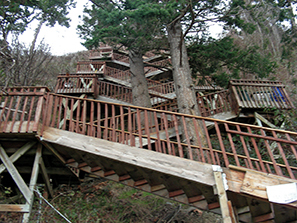 Whether you are just clearing a little land, or building a dock, a staircase to the beach, or a dream home, you have a lot of decisions to make, regulations to follow, and safety issues to consider. The Shoreline Management Act (SMA) was adopted by voters in 1972 and covers more than 20,000 miles of Washington State saltwater, river, and lake shorelines. This includes more than 2,600 miles of saltwater shoreline. The SMA seeks to protect and preserve our shoreline resources, provide reasonable use of the state’s shorelines, and to preserve the public’s right to access the shorelines. Local governments have the responsibility to develop Shoreline Master Programs to carry out the policies of the SMA at the local level. Most projects near the shoreline require a “substantial development permit”. Certain kinds of development are exempt from substantial development, conditional use, and/or variance permit requirements, and under certain circumstances local governments can allow deviations from Shoreline Master Program (SMP) provisions. Existing structures may be “grandfathered in” and not subject to new regulations, but new changes must follow your county’s SMP. Buffer widths vary based on the steepness and stability of your slope, wave action, fish and wildlife habitat needs, and how your area of shoreline has been “designated” by the city or county in the SMP. Check with your local planning department to find out how far from the water’s edge you can build. Sheds, decks, and patios may require a different distance from the shoreline than a house. After the pre-application conference or meeting, if you have one, you may file your application which should include: a detailed site plan, a vicinity map, text describing the location of proposed use, proposed and existing structures, utilities, fill, information on the natural shoreline environment, local shoreline designation information, and the location of the Ordinary High Water Mark (OHWM). A State Environmental Policy Act (SEPA) checklist is also often required. When a shoreline permit is required, the local jurisdiction will typically be the lead agency for SEPA but not always. Your local government will conduct a technical review of your proposal and they will make a decision on your permit application. You may appeal the decision on your permit at the local level, if your government has an appeal process, as well as at the state level by the Shorelines Hearings Board. Following the decision, your application is sent to the Washington State Department of Ecology. Ecology’s role is to review permits with an emphasis on providing assistance to local government and on insuring compliance with the Shoreline Management Act. Ecology will approve, approve with conditions or deny each conditional use permit and variances. Ecology does not have direct approval authority over the more common permits; however, if they are found inconsistent with the local shoreline acts and plans, Ecology may file an appeal with the Shorelines Hearings Board. Each county also works with the Department of Ecology to coordinate with the State Department of Fish & Wildlife, Department of Natural Resources, and the US Army Corps of Engineers. The Department of Natural Resources is a participant where state-owned tidelands and bedlands are involved. When applying for a permit to do work along a shoreline, you may also need to go through the Washington Department of Fish and Wildlife’s Hydraulic Project Approval (HPA) process, which is designed to protect fish. WDFW Habitat Biologists are available to help people and groups apply for an HPA and ensure their projects meet state conservation standards for aquatic life. Any construction activity below the ordinary high water line requires a HPA permit, even if the activity is outside the water at the time it is undertaken. If you live on a freshwater lake or stream, see Guideline 6 for more information. Check with your city or county building department whenever you are planning any clearing or development near the shoreline, to see what their requirements are regarding setbacks, buffers, clearing and grading. Most cities and counties require you to preserve natural vegetation along shorelines. There may also be additional restrictions placed by your homeowners association, if you belong to one. Whether you are hiring a general contractor or are acting as your own general contractor and hiring subcontractors, you will need to obtain appropriate permits. It is important to make sure your contractor has experience with all steps in the shoreline permitting process, and that you have checked references. If you are acting as your own general contractor, you may want to hire a consultant to guide you through the permit process. Check with your local planning department to see if they offer a Pre-Application Conference, where you can meet with staff and discuss your development proposal before you submit your formal application. Most cities and counties in the Puget Sound area offer this, which may be free or may require a fee. Depending on the project, the meeting may allow you to ask questions of staff from the health, planning, and building departments. Other staff from federal, state, or city jurisdictions may be asked to attend to help with specific issues. There is likely a Pre-Application Checklist that you will need to fill out prior to requesting a conference or meeting, which will include information and maps about your proposed construction or clearing activity.